Floxin (Ofloxacin) is an antibiotic. It kills certain bacteria or stops their growth, treats urinary tract, prostate, skin, urinary and respiratory tract infections, as well as certain sexually transmitted diseases. 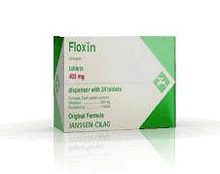 Do not take floxin if you have any of these conditions: arteriosclerosis, dehydration, heart disease, kidney disease, liver disease, long exposure to sunlight (working outdoors), seizures (convulsions), stomach problems (especially colitis), stroke, tendon or joint pain, other chronic conditions, an unusual or allergic reaction to fluoroquinolone antibiotics, foods, dyes, or preservatives, pregnant or trying to get pregnant, breast-feeding.